The par-71 golf course at Heritage Links Golf Club measures over 6600 yards from the back tees for a healthy challenge. It was designed by Joel Goldstrand and opened for play in 1997. The manageable length of our golf course along with our affordable anytime rates make Heritage Links Golf Club your best choice for outdoor recreation. Consider Heritage Links for your next golf or corporate outing! 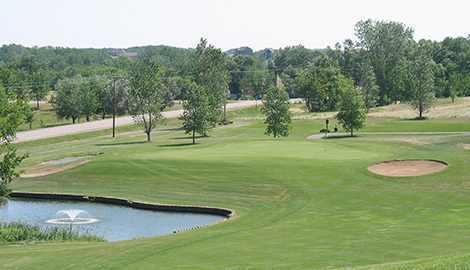 Located in Lakeville, Minnesota just three miles west of 35W on County Road 70, our South Metro golf course is a beautiful 18 hole, par 71 championship course. The front nine has a links feel to it with water and rolling terrain. The back nine is more wooded, lined with trees, water, bunkers and great elevation changes. The entire course itself consists of 45 bunkers and water comes into play on 16 of 18 holes. Heritage Links offers a challenge for all skill levels from beginner to experienced. Four different sets of tees ranging from 5,145 yards to 6,672 yards should allow you to find your comfort zone quite easily. Take a golf course tour to find out more. Before your round it is advised you take advantage of our exceptional practice facility with its’ wide open driving range and well manicured putting green to prepare yourself for what lies ahead. After your round visit our clubhouse which features a full service pro shop staffed by PGA Professionals that offers club fitting, club repair and lessons. Our clubhouse also hosts a large banquet facility, the perfect place in Southern Minneapolis to hold wedding receptions, business meetings, company conferences, golf parties and other social events. Tee times can be made seven days in advance online or by calling 952-440-GOLF. Enjoy one of the best practice facilities in the Twin Cities featuring a full length grass driving range and large practice putting green.